As per the legend Semur was built by the legendary figure of Hercules on his return from Spain. What we know is, that in the 7th century there has been a castle. 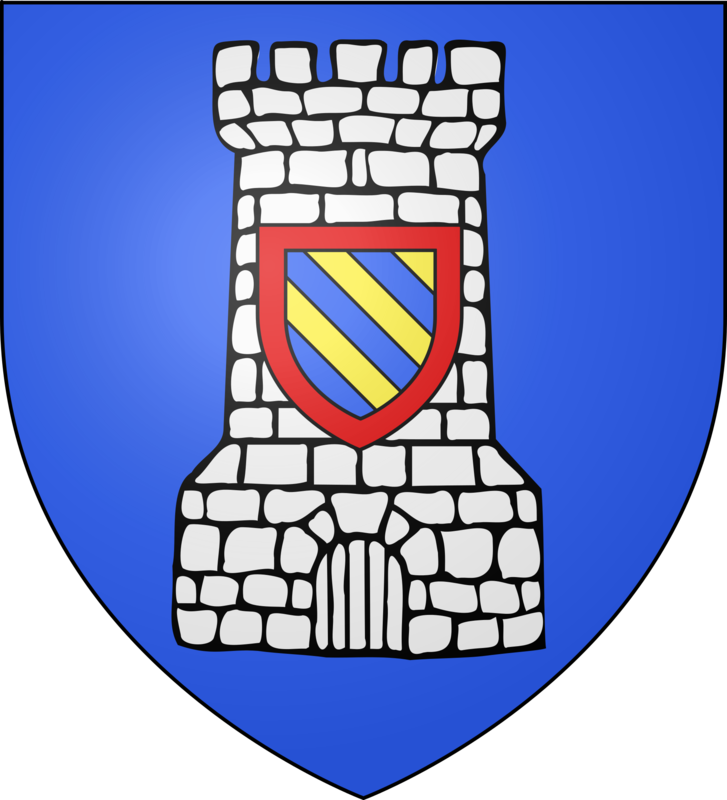 The name Semur first appears in the 8th century in the founding document of the Abbey of Flavigny. Its etymological origin derives from the Latin words “senes muros” (the old walls). The town is located in the western part of the department Côte-d’Or, about 20 kilometers south of Montbard. It is located on a bend of the river Armançon, which at this point cuts a granite rock deeply. The town is situated around the four towers of the former castle, and merges with the rose-colored rock. 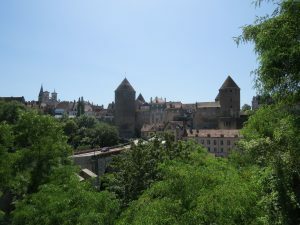 The medieval city gate Porte Sauvigny was built in the 15th century. With its two towers, formerly a moat, a drawbridge and a portcullis it marks the entrance to the city. By the quiet pedestrian street in the city center you get to the churchyard. The church of Notre-Dame is considered as a remarkable example of Gothic art. The largest part of the building dates from the first half of the 13th century. 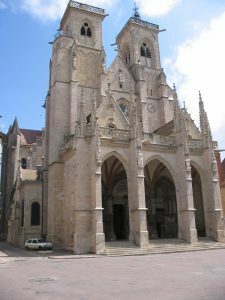 The facade and the towers were built in the course of the 14th century. Finally, in the 15th and in the 16th century the porch was added and the side chapels were set. The church was restored in the middle of the 19th century by the architect Viollet-le-Duc. On the stained glass windows you can see expressions of the local guilds. Outside you discover falsework and devilish gargoyles. The two buildings are now part of the town hall. The Rue de Rampart goes around the four surviving round towers of the former citadel, including the Tour de l’Orle d’Or, which is named like that because of its glittering roof and before the establishment of the Pont Joly it represented the entrance to the city. From this bridge you have a picturesque view over the city. The walk on the promenade planted with lime trees offers also a beautiful view over the river and its surroundings.